Written by: Beau Brockett Jr. Eight candidates for the Michigan legislature outlined their solutions to environmental problems to a packed conference room at June 28’s Kent County Candidate Forum on the Environment. Clean water and environmental justice became the two top talking points. The event was organized by WMEAC, Citizens Climate Lobby, Dominican Sisters of Grand Rapids, Schrems West Michigan Trout Unlimited and Sierra Club. 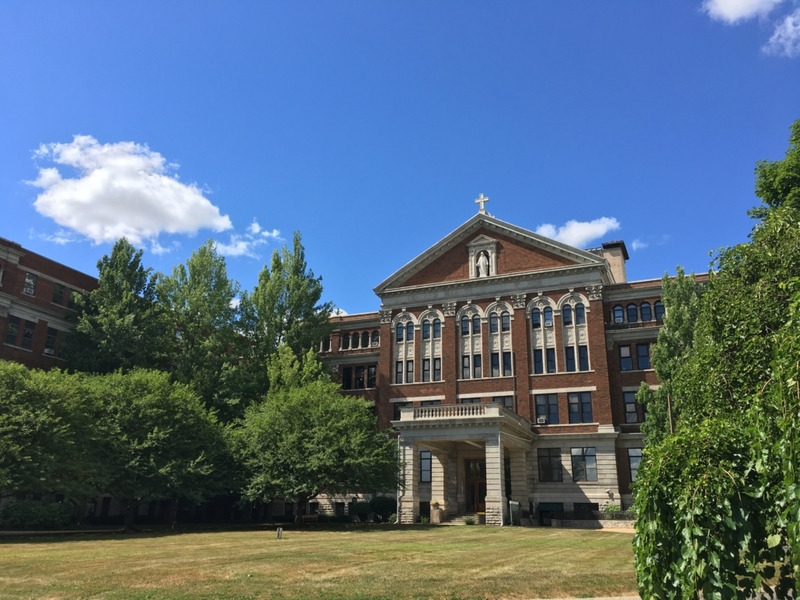 The Dominican Sisters hosted the forum at their Marygrove campus. Former Grand Rapids Mayor George Heartwell hosted the event and former Michigan legislators Chris Kolb and Ken Sikkema moderated the panel. Sikkema and Kolb asked their own questions to the candidates, then chose questions from audience question cards. The seven Democrats and one Republican were the first to respond to an invitation sent to all candidates running for seats that serve part of Kent County. The following list provides the names, parties and residences of each participating candidate. To locate your districts, click here. Moderators and audience members alike expressed their concern over Michigan’s water. Sikkema provided the opening question, asking candidates the best way to raise money for water infrastructure improvements. Hood said multiple funding sources were needed, like foundation grants, federal money, revenue sharing, bonds and business fees for water extraction. Ousch said he would determine where government funding was currently going to and what its return on investment was before establishing infrastructure funding priorities. LaGrand countered both candidates’ method, saying Hood’s methods only shifted money from one source to another and Ousch’s method would generate little revenue. LaGrand called for a progressive income tax and a refined corrections system that incarcerated fewer people. Saxton sided with market-based solutions, saying that business should pay accordingly for the water they use. As moderator, Kolb asked candidates if they would support legislation that reduced agricultural runoff and created a septic code. Leaking septic tanks and runoff can contaminate water systems. Both Brinks and Draayer, supporting the hypothetical legislation, said that farmers should be involved in policy creation. Beach’s offered his own twist on the legislation to entice farmers. If they abided by septic codes and runoff laws, farmers would receive a reward. If they didn’t follow measures, they would be given a pollution tax. “If you don’t have clean water, farmers, you don’t have a job,” said Taylor. When a question from the audience asked candidates if Wolverine Worldwide was responsible for contaminating the Rockford-area water system with potentially harmful chemicals, Saxton and Beach said the shoe company should be brought to court. Brinks said that community pressure was necessary to remind corporations that they have a moral responsibility to provide clean drinking water if they pollute water systems. She said that all costs of environmental cleanup should be covered by Wolverine Worldwide. All candidates agreed that Michigan’s decision to approve a Nestle request to increase water withdrawal in Osceola County was unfair. The permit for increased withdrawal from 250 to 400 gallons a minute was only $200. Solutions ranged from a designation for water to be held in public trust by Brinks to Nestle’s withdrawal either being stopped, slowed down or become costlier for the company by Oesch. The final question of the night asked candidates what they would do to ensure a Line Five breach never occurs. Line Five is composed of twin Enbridge oil pipelines that run from Wisconsin to Sarnia, Canada, under the Straits of Mackinac. All the oil comes from Canada and 90 percent of the oil returns to Canada. LaGrand set a tone that reflected Brinks’, Beach’s, Taylor’s and Draayer’s responses. “The only way to have 100 percent assurance of something is to eliminate it,” he said. A public question forced candidates to consider social equity and inclusion in their environmental policies. The question asked candidates how they would implement Michigan’s Environmental Justice Report’s recommendations. The Environmental Justice Report is a guideline to implementing environmental justice measures in government decisions. Draayer pointed out that nearly half of Michigan residents live in an area of elevated smog levels. Many of those residents are low-income. He said it reiterates the importance of alternative transportation. Environmental justice changed Hood’s perception of racism. She said that environmentalism has a long history of being white and of promoting a not-in-my-backyard approach that left minority communities in poor health from environmental conditions. Hood said that the report should be considered across Michigan’s government decisions. Brinks believed so, too. She said she would re-introduce her bill that required the Michigan EPA to consider the report in all its decision-making. “If it impacts people negatively and in a disproportionate way, it must be considered,” she said. Michigan’s primary election is on August 7. Voter registration for the primary was due July 9.